The last time I made a Thai Yellow Curry was back in September when we still had the taste of summer – courgettes, french beans, summer squash and cucumbers, all grown on the allotment. It’s time I revisited this curry, but winter style. I’m fond of yellow curries and cucumber dipping sauce, the two work supremely well together; with the rich spicy creamy coconut curry mixed with a dash of rice wine vinegar based dressing and the crunch of fresh cucumber. Sounds unusual? Maybe, but it does work. I realise the cucumbers are fantastically out of season for me, but I’m currently in the Alps and I think if I didn’t eat at least some fresh, unseasonal food I’d go stir crazy, or at least end up a mile wide based solely on an Alpine diet of potatoes, cheese, cream and lardons! Grand Frais had some small cucumber in stock last week, and I snaffled a couple, with this recipe in mind. That and some long walks will hopefully keep the pounds at bay. So onto the recipe, a bit more research and this time I’m trying Rick Stein’s version, which in turn is based on David Thompson’s. David Thompson is a Thai food expert, and if you haven’t had a look at his books I strongly recommend you remedy that; the book is packed with detail on the origins of the food he cooks, the areas, the ingredients. It is encyclopedia-like in its depth. And I’m sure you wouldn’t be disappointed with the recipes. The time needed to make this fresh and firey curry is in the preparation of the curry paste, after that it’s a matter of chopping a few veg, stirring the pot every now and then, and putting some rice on to cook. And as with any curry paste I make, the spares go into a tub in the freezer for another day. The recipe here will make enough for 2 batches. For a pure vegetarian version omit the shrimp paste and fish sauce. In a food processor or pestle and mortar put all the ingredients for the paste including the re-hydrated chillies, but not the turmeric. Add 2 tablespoons of the chilli water and mix the ingredients into a fine smooth paste. you may need to add a bit more water to help with this. It will take a few minutes in a food processor to get the paste into a smooth consistency. When mixed, stir in the turmeric. Take 2 tablespoons of the curry paste and add them into a pan, cook on a low heat for a few minutes. Add the coconut milk, and mix it into the paste well. If at any stage the sauce is too thick add a little cold water, to thin it. Serve with plain rice and the dipping sauce spooned over the curry. Yummy! It’s always fun to revisit and alter recipes. This sounds really delicious. I love Thai food, particularly the curries. I haden’t heard about it before I ate it in a restaurant and then I had to find a recipe! Lovely. I llove David thompson and Rick stein. Your curry sounds delicious, Claire. It is nice that you can get your Thai ingredients in the Alps. This curry paste recipe is fascinating. I must try it, tho am confused by 3 dried red chillies and 1 red chili (I presume fresh as it’s not with the 3 dried) and wonder how important that detail is! Are they different types of chillies? Hi there and thanks for the question, questions are always good as they make me think a bit more about how I write things up. I use both dried and fresh – don’t always have fresh, and perhaps not often enough to have developed such a refined understanding of the difference. I would have to agree, however, that fresh chillies with pasta would make a dish very diff, whereas with a curry they would change the type of heat. Correct? Yes they would change the heat, Have you tried freezing fresh cillies? I freeze all my chillies whole in a container, they keep superbly, and the heat remains the same! We have a local restaurant, where the chef is Indian-born, American-raised, and French-trained. His fusion dishes are incredible, and he’s the one who taught me about cucumber sauce to balance the heat of curry dishes. I can’t get enough of it now! Now that sounds like fantastic Fusion food, I do hope you get to the restaurant Marie. Bon appetit! Nice. Curry is one of my favorite food. I often eat it. Pleased you like it ! This sounds fabulous! Thanks for posting. I’ve never made yellow curry, Claire. My favorite is green, which I make as soon as basil and cilantro are in the market together and store in the freezer. Nor have I curried winter squash, but I have three of them sitting on the counter. I think my favourite is green too, somtheing about the flavour of corriander with chillies and coconut. And 3 squash on the counter, bread? Such a colourful and, I’m sure, tasty dish. It certainly is, it has quite a strong shrimp paste/fish sauce taste which depending on your taste is a good thing or not! I love squash in curry! This sounds delicious (and healthful)! 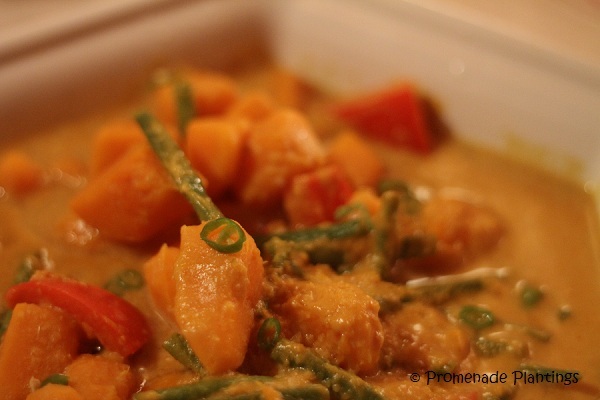 I would love a bowl of this tonight.. it would be the perfect sunny yellow curry for the beautiful day we’ve had!! This sounds delicious. Looking forward to trying out the cucumber sauce too. It’s a new ‘dish’ for me. I bought a cucumber at the markets this weekend so I’ll give it a whirl. BTW, am I right to assume that winter squash is pumpkin? Kathryn I love the dry curries too, in fact I’ve been playing around with some Indian style ones, and yuuuuuuuuuum. I need to get round to posting some mor eof the recipes…. Another fantastic curry recipe Claire (I didn´t get to eat my curry last week though 😦 ) and i know what you mean about sometimes needing to eat something, even if it´s horribly out of season! Ooh – kedgeree perhaps or a curried soup? I love kedgeree but no………and curried soups/lentil soups, loev ’em but no…….